FRANCIS I by Reed and Barton sterling silver Place Service for 12. The set consists of the following pieces: 12 9 1/8" Place Kvs. ; 12 7 1/8" Place Fks. ; 12 6 1/8" Salad Fks. ; 24 5 7/8" Tsps. ; 12 5 7/8" Cream Soup Sps. ;12 ice cream fks. and 12 5 1/8" flat spreaders = a total of 96 pieces. The condition is wonderful. There has never been a monogram. Click more images for detail images. 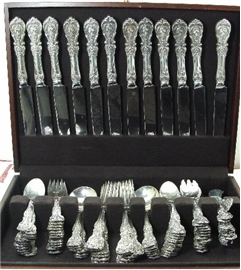 Wonderful, OLD, 108 piece DINNER & LUNCH sterling silver flatware service for 12 in the handsome Francis I pattern by Reed & Barton. The length of the 12 dinner forks is 7 1/2"; the 12 New French dinner knives are 9 1/2"; the 12 lunch forks are 7 1/8”; the 12 New French lunch knives are 9 1/4”; the 12 salad forks are 6 1/8”; the 24 teaspoons are 5 7/8”; the 12 cream soup sps. are 6 1/4"; and the 12 flat butter spreaders are 6 5/8” - a total of 108 pieces. The condition is great; the pattern is clear with nice oxidation. No monogram. The marks, which have been photographed, are the OLD Reed & Barton hallmark. The dinner forks, lunch forks, and teaspoons all have the "H" mark, indicating that they are of heavy weight. The set will come in a NEW Reed & Barton flatware chest with a bottom drawer. FRANCIS I DINNER KNIFE, New French Blade, 9 1/2"
FRANCIS I SALAD FORK, Old Mark, 6 1/4"